Mountainite: Mineral information, data and localities. Named by J.A. Gard, H.F.W. Taylor, and R.A. Chalmers in 1957 for Edgar Donald Mountain (2 April 1901 – 30 April 1985), Professor of Geology, Rhodes University, Grahamstown, South Africa, who provided the first specimens for investigation. 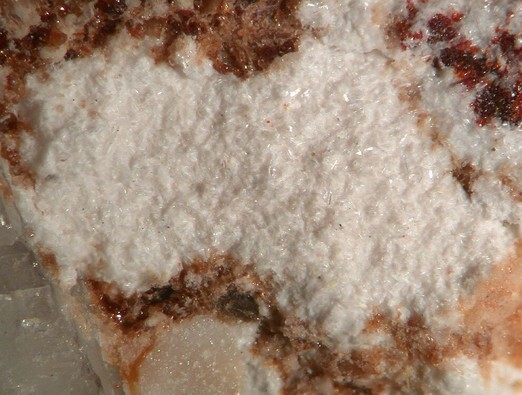 Closely related to cryptophyllite and shlykovite. one doubtful in prism zone. As matted laths and fibers, elongated along , forming small rosettes, to 2 mm. The Natural History Museum, London, England, 1957,369; National Museum of Natural History, Washington, D.C., USA, 114792. Vitusite-(Ce) 4 photos of Mountainite associated with Vitusite-(Ce) on mindat.org. Steenstrupine-(Ce) 4 photos of Mountainite associated with Steenstrupine-(Ce) on mindat.org. Natrolite 4 photos of Mountainite associated with Natrolite on mindat.org. Sazhinite-(Ce) 2 photos of Mountainite associated with Sazhinite-(Ce) on mindat.org. Magnesio-arfvedsonite 2 photos of Mountainite associated with Magnesio-arfvedsonite on mindat.org. Raite 2 photos of Mountainite associated with Raite on mindat.org. 9.GG.05 Cowlesite CaAl2Si3O10 · 6H2O Orth. Gard, J.A., Taylor, H.F.W., Chalmers, R.A. (1957) An investigation of two new minerals: rhodesite and mountainite. Mineralogical Magazine: 31: 611-623. Fleischer, M. (1958) New mineral names. 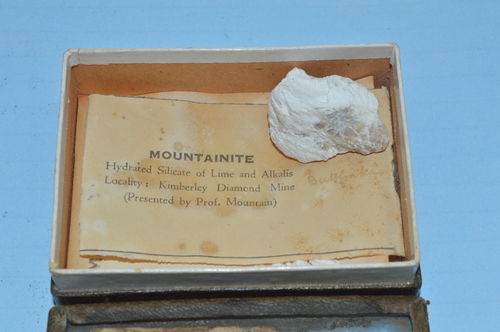 American Mineralogist: 43: 623-626. Zubkova, N.V., Pekov, I.V., Pushcharovsky, D.Yu., Chukanov N.V. (2009) The crystal structure and refined formula of mountainite. Zeitschrift für Kristallographie: 224: 389-396. Pekov, I. (1998) Minerals First discovered on the territory of the former Soviet Union 369p. Ocean Pictures, Moscow; Zubkova, N. V., Pekov, I. V., Pushcharovsky, D. Y., & Chukanov, N. V. (2009). The crystal structure and refined formula of mountainite, KNa2Ca2 [Si8O19 (OH)]⊙ 6 H2O. Zeitschrift für Kristallographie, 224(8), 389-396.; Pluth, J. J., Smith, J. V., Pushcharovsky, D. Y., Semenov, E. I., Bram, A., Riekel, C., ... & Broach, R. W. (1997). Third-generation synchrotron x-ray diffraction of 6-μm crystal of raite,≈ Na3Mn3Ti0. 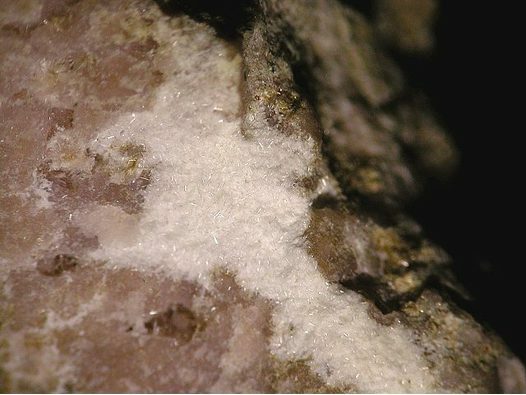 25Si8O20 (OH) 2⋅ 10H2O, opens up new chemistry and physics of low-temperature minerals. Proceedings of the National Academy of Sciences, 94(23), 12263-12267. Barnes, I., J.B. Rapp & J.R. O’Neil (1972), Metamorphic assemblages and the direction of flow of metamorphic fluids in four instances of serpentinization: Contributions to Mineralogy and Petrology: 35: 264; Pemberton, H. Earl (1983), Minerals of California; Van Nostrand Reinholt Press: 442; www.mineralsocal.org.